Guerrilla warfare idols equipped with floating dance platforms living lights and mecha. Pretty much tells you about ¾ of this entire series. In a future time when the earth seems to be no longer habitable humans have colonized many worlds, and on most of them entertainment and anything else that “disturbs the heart” is illegal. In the middle of this is a group of idols that fight to give planets the entertainment they desire. 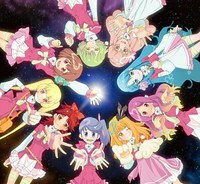 The group AKB0048 is more of a generational group as each year they get more people joining who try to take over for older people. This anime is centered around the girls of the 77th generation who try to prove themselves to the fans of akb0048 while they try to discover themselves. In all honesty, if seeing that this is a mecha made you want to watch it don’t, the mecha bits are small and far between. The anime itself focuses on the music and the drama between characters and does this very well luckily. I’ll also point out that the music/dance scenes in this anime jump between animation and CG relatively often and almost seamlessly allowing the dance scenes to work very well, later in the anime I caught myself attempting to sing along to some songs. Basically what I’m saying here is that the story and relations between characters if great and the actual dances are not bad either, and with the somewhat dark side story that develops it keeps you guessing and hoping the second season that is currently coming out answers your questions and my own about how things will progress..
Posted on January 20, 2013, in Drama, Sci-fi and tagged idols, mecha, music. Bookmark the permalink. Comments Off on Akboo48.